Heart disease is the leading cause of death among American women. 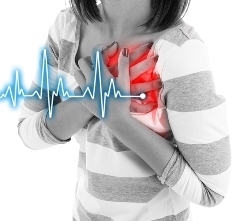 The American Heart Association states that 1 out of 3 female deaths occur as the result of a heart-related issue. However, heart attacks and heart disease are persistently regarded as largely male problems. A Centers for Disease Control and Prevention (CDC) survey found that only about half of women recognized heart disease as the leading killer of women. Increasing the danger of heart disease to the female population is the fact that 64 percent of the women who die suddenly of coronary disease showed no previous symptoms. Additionally, the classic, well known heart attack symptoms often do not present in women, making it more difficult to diagnose the problem in a timely manner. When healthcare providers fail to recognize the signs of a heart attack in women, the consequences can be serious, even fatal. Known in the medical community as a myocardial infarction, a heart attack occurs when the flow of blood to the heart is blocked. The heart cannot get the oxygen it needs, and the muscle starts to deteriorate. The longer the heart is deprived of vital oxygen—the more damage is done. The muscle can die or damaging scar tissue can be formed. Atherosclerosis. Atherosclerosis, or the buildup of plaque in the arteries, is the most common cause of heart attacks. When plaque builds up, it can block the blood flow through the arteries and dangerous blood clots can form, leading to heart attack and stroke. Heart failure. The heart still pumps, but does not work as efficiently as it should. This results in decreased oxygen flow to the muscle. Arrhythmia. This is an abnormal beating of the heart. The heart can beat too fast, too slow or in an irregular pattern. This can affect how blood is pumped out to different parts of the body and overall heart function. Valve problems. When a valve does not open or close properly, it affects blood flow. If a valve does not close all the way, blood can leak through. In some cases, the blood can prolapse into the upper chamber, causing blood to flow backward. Artery spasm. Though less common, the artery can spasm and block the blood flow to the heart. There are many underlying causes of heart attacks. Risk factors like smoking, illegal drug use, high blood pressure, high cholesterol and obesity all increase the likelihood of experiencing a heart attack. In addition to some of these non-traditional symptoms, a number of studies have reported that women simply have a harder time getting heart-related tests and treatments. Providers are less likely to order these tests for women, and many women who have experienced a heart attack report they had to be proactive and persistent with their medical teams to get the care they needed. Additionally, women themselves shoulder some of the blame. Women are less likely to seek medical treatment and call 911 for themselves in an emergency. Many heart attacks are not the dramatic, chest-clutching events shown on television, especially for women. Unfortunately, some women experience no symptoms and a devastating heart attack cannot be foreseen. In many other cases, though, the dangers and damage of a heart attack can be mitigated with prompt and thorough medical care. Experts encourage both men and women to seek medical treatment immediately if they have any concern about a heart attack. If you or someone you love suffered complications or died as a result of a missed heart attack diagnosis, you may be entitled to make a claim. Contact the experienced legal team at the Tapella & Eberspacher Law Firm at 855-522-5291 to schedule a free, no-obligation consultation today. What Makes a Malpractice Case? What Is "Reasonable Standard of Care"?